North East History is the journal of the North East Labour History Society. Members of the Society receive the journal as a benefit of membership. See the ‘Join Us’ page for information about how to join. Issue 1 and Issues 36 (2005) to 48 (2017) can now be uploaded from our past issues page.
. Price per issue is £5, plus £2 p&p within the UK / £5 international. Click here for an index of Issues 1 to 39 (1967-2008). The list will open in MS Excel. We don’t currently have an index of Issues 40 to 48 of the Journal, but the full contents of these Journals can be accessed here. Would you like to contribute to the Society’s Journal? 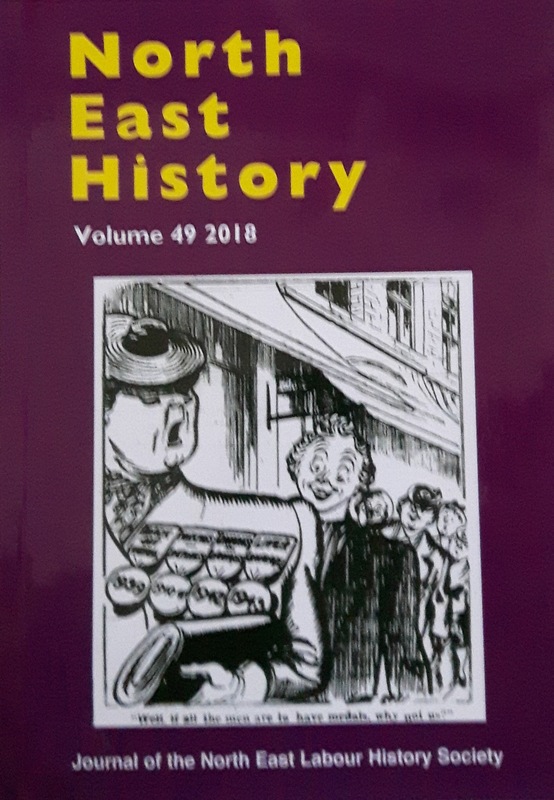 For our journal, we encourage a wide range of social history topics including public health, popular politics, working lives, welfare provision, housing and community, leisure and recreation, in addition to mainstream labour history such as trade unionism, Labour politics, and the co-operative movement. We are particularly interested in hearing the voices and experiences of under-represented groups, for example working women, migrant workers and their families, and people with disabilities. We encourage and welcome contributions from anyone with a story to tell; you do not need to be an academic historian to contribute an essay. If you have an interest in the lives of working people, past or present, and would like to contribute then please contact us. Our `First Tuesday’ programme of informal workshops is available to help you develop your contribution, and will allow you to share initial thoughts and findings with fellow enthusiasts. These meetings take place on the first Tuesday of the month and are open to anyone. Refer to the Society’s website for details of programme and location. Likewise, if you have little experience of writing, or have not used a formal reference system such as endnotes and would like help in doing this, then please refer to a recent edition of the journal or contact the Editor(s) and we would be happy to help. , and click here for Guidance for Authors. The document will open in MS Word.